More than 14,000 runners finished out of the 15,000 who registered, compared to last year’s tally of just under 6,000. The reconfigured 13.1 mile course took them through Grand Army Plaza, around Prospect Park, down Ocean Parkway, and along the Coney Island Boardwalk to a finish line just shy of the Scream Zone. Guess which Coney Island event is televised. 14,000 people completing a half marathon or 10 people downing 300 hot dogs? #joeychestnutftw! If that other borough’s half marathon, the one that starts in Central Park and ends at South Street Seaport, got two hours of live television coverage for the first time this year, why not Brooklyn’s? Here’s photographer Bruce Handy’s slide show of the race, from the construction of the finish line outside Ruby’s Bar to the runners arriving in Coney Island and sprinting past the landmark Cyclone and Wonder Wheel to victory. June 16, 2011: Last Chance to See Mermaid Parade Before It Turns 30! Thank you, Tricia for your dedication to the People’s Playground. 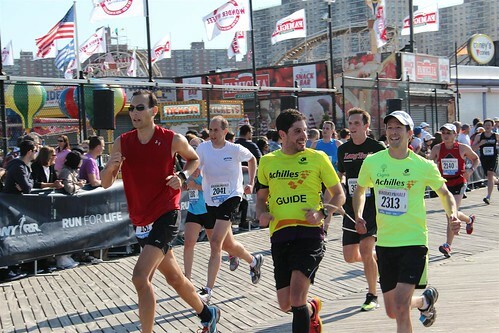 Gigantic crowd converged on Coney Island to see the Brooklyn Half. The race for first and second place for both the mens and womens was a sprint to the finish, mere seconds apart. The womens third and fourth finishers sprinted the boardwalk, with the fourth place finisher breaking stride in front of Lolas, steps from the finish line. EXCITING RACE. I watched the last runners struggling to finish which was very inspirational. The next to last runners were a blind man and a woman helper, the last runner was an elderly man, with cuts on his legs from falling, being helped by one of the runners who had already finished. My favorite photo is this one. Sounds dramatic. Good advertisement for Brooklyn if it’s televised next year!